Dr. Bill Cortner (Jason Evers) has been experimenting with new advancements in transplantation and thinks he’s come close to devising a way to keep certain body parts alive so they can be transplanted. 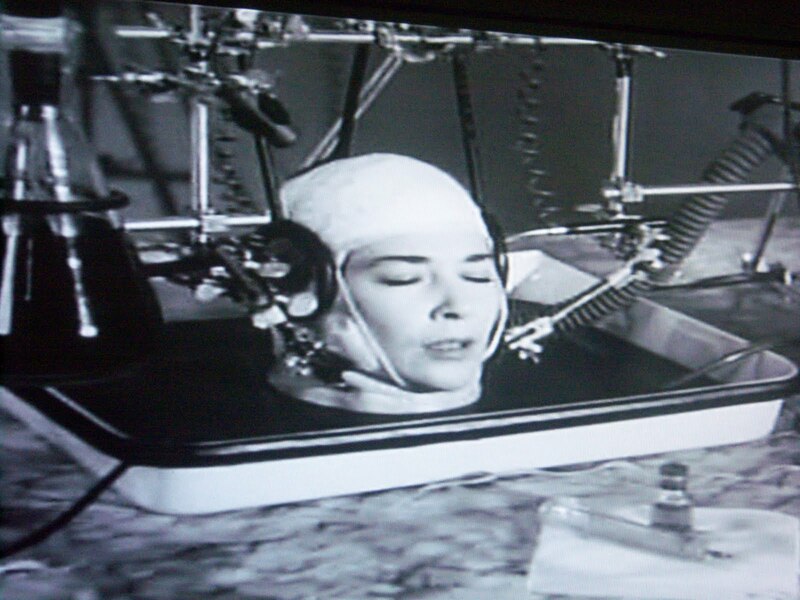 All of that experimentation comes in handy when Bill’s fiance, Jan (Virginia Leith) is decapitated in a car crash. Bill is able to save Jan’s head from the wreck and begins making plans to hunt down a new body for it – but it turns out Jan isn’t too happy about being saved. 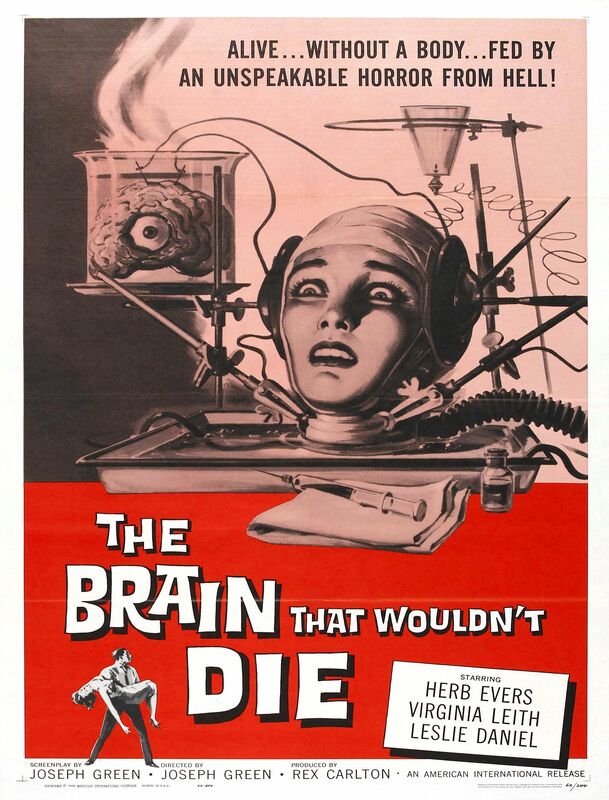 “It’s madness, not science!” in Joseph Green’s The Brain That Wouldn’t Die (also known as The Head That Wouldn’t Die). Green co-wrote the story with Rex Carlton and adapted it for the screen. The film starts out a bit slow, but the time is well-used to set up the idea of Dr. Cortner engaging in odd experimentation. Once Jan quite literally loses her head, The Brain That Wouldn’t Die grows into a beautifully bad B-movie. For fans of B-horrors such as myself, it’s hard not to fall in love with the completely whacky “keep girlfriend’s decapitated head alive” premise. The acting is pretty overzealous, especially from Jason Evers, but it works for this grand piece of cheese. Evers is portraying a mad scientist – the film wouldn’t make sense if he didn’t act crazy. Despite all of the cheese, a few of the scenes do bring a bit of legitimate thrill and suspense. Virginia Leith adds to the film’s genuine goodness with her awesome performance as “Jan in the Pan.” She has an evil laugh, a bitter attitude and delivers her lines just seriously enough to give the film a tiny bit of real creep factor rather than just laughs. Fans of sci-fi will appreciate the wonderfully designed science lab, which would fit perfectly in any great sci-fi film of the 1950s or 1960s. It’s full of mysterious, spiral-shaped cords, suspicious liquids and beakers of varying sizes. Oh my yes, what a Grade Z classic indeed! And any horror film that has fighting strippers, a monster in a closet, and a decapitation can’t be all bad, right? Actually, I thought it was a little too static and talky for a schlocky horror film, but it really wasn’t all that poorly made, considering the cost. And of course there were fighting strippers. It was a bit talky, but I was in the perfect mood for it when I watched it so I ended up loving it. Plus, it allowed me to add “cheap third grade stripper” to my repertoire of insults… what’s not to love? You’ve convinced me! I’ll be using that insult at work next week…and I’ll let you know if I get slapped for my efforts!